Santander ends up the simulated 2019 MVO! Widely considered the most accurate baseball simulation on the market, Out of the Park (OOTP) baseball simulation game is a great tool to have fun with what if scenarios and even predictions. The game continues to improve year after year and this year OOTP 20 has even more impressive upgrades including live rosters availability once the season starts. Getting my hands on the new OOTP game is one of the highlights of my spring. Now I typically play historical leagues in what if scenarios like the time I took over the 1976 Orioles and resigned Reggie Jackson and Bobby Grich to long term contracts. With that team I won six straight AL East titles (76-81) and three straight World Series (79-81) championships. In another scenario I took over the Orioles prior to the 1988 season in order to rebuild the organization the right way by selling off veterans for prospects (even Eddie Murray at the trade deadline though that one hurt) and rebuilding through young projectionable talent. I lost 106 games the first year and 92 in 1989 (Why not team), but by the 3rd year the team hit on all cylinders and I ended up winning 104 and 109 games in 1990 and 1991. Now I lost twice in the World Series to a really amazing San Diego Padres team, but it was a fun exercise. I’m in 1992 with that scenario in and in first place in late May. This year I decided to try and do a predictive scenario in which I took over the Orioles. Funny note, it says Mike Elias is my assistant. Hey, at least I keep good people around me. 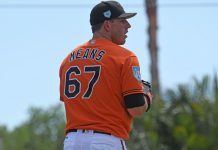 Basically I really wanted to just check out the features for a review, but I decide to set the Orioles openings day roster to the roster I predicted in my article a few days ago. So with that in mind, I took this opening day lineup into Yankees Stadium against Luis Severino and the Yankee bombers. Alex Cobb got the opening day start. It might seem aggressive to bat Ruiz 4th, but he got the Orioles on the board in the bottom of the 1st hitting a long two-run homer into the RF stands to get the Orioles on top 2-0. In the bottom of the 1st, With Miguel Andujar on first, the Yankees got one back when Aaron Judge hit a ball to the wall that should have put runners on 2nd and 3rd, but perhaps sensing Mullins’ weak arm, he “stretched it” to home and was safe. In the top of the third though, the Orioles got back on the board when Martin singled to lead off the inning, Mullins lined out, but Villar walked and Mancini singled to left to load the bases with one out bringing Ruiz up to the plate. In a batting position that Chris Davis would normally bat under Buck Showalter last year, Ruiz took a 1-2 Severino fastball and hit a long drive to deep center field. Aaron Hicks though caught the ball at the fence, and Martin scampered home to make it 3-1. Nunez then reached on an error by Andujar at third, scoring Villar to make it 4-1. Cobb continued to cruise but Troy Tulowitzki got to him in the bottom of the 5th with a home run to LF to cut the lead to 4-2. At only 80 pitches, I started the 7th inning with Cobb on the mound but had Miguel Castro up in case any signs of trouble. After getting Gary Sanchez on a flyball to center, Clint Frazier smacked a double to put the tie run at homeplate. I decided to let Cobb try and get out of this and he induced Tulowitzki to ground to Ruiz at third who booted the ball putting runners on 1st and 3rd with one out. I considered bringing in Castro to induce the double play, and in retrospect probably should have, but I let Cobb face Hicks, who was 0-for-3 against Cobb today. Hicks hit a fairly deep fly to RF that was deep enough to score the runner from 3rd to make it 4-3. Feeling like I pushed him far enough, I replace Cobb with Castro to face Giancarlo Stanton. On 2-2, Castro froze Stanton was one of those arm side run fastballs for strike three to end the threat. Castro pitched a shutout 8th and I brought in Mychal Givens for the save in the 9th. Coming off a tough spring, Givens was looking to rebound in the regular season by Sanchez roped a fastball to deep left center for a standup double and then Givens walked Hicks to put runners in 1st and 2nd and no outs. Tulowitzski came up next and hit a long line drive to left center that Sith was able to track down, but Sanchez tagged and went to 3rd putting the tie run on 3rd with one out. I brought the corners in but left the middle infield in DP depth with speedy Aaron Hicks coming to the plate. Hicks had a one hopper directly at Mancini who fielded the ball, checked the 3rd base runner back, then made the unassisted putout for the second out of the inning, but moving Frazier to 2nd. This brought up Stanton to the plate as I’m sure the Yankees home crowd were on their feet. Givens ran the count to 3-2, and he had to consider not giving in the slugger with 1st base open, even though dangerous Miguel Andujar was on deck. Givens broke off a great slider away that Stanton whiffed on for strike three. But, the slider was so good that it clipped off catcher Chance Sisco’s mitt and headed back to the wall as the tie run scored and Stanton made it safely to first. The game was tied on a swinging strike out passed ball by Sisco. Perhaps frustrated, Givens on his 20th pitch of the appearance, threw a fastball that Andujar lined into left field for the game winning hit. Yankees win 5-4 as they rush from the dugout and join in celebration of their remarkable win (yes, the players on the field celebrate as fireworks can be heard going off as the crowd roars). So there you have it folks, OOTP simulated runners taking extra bases on Mullins arm, a passed ball by Sisco that cause a blown save from Givens after the Orioles were up to 4-1 to start the game. Not to be a downer, but nothing in that scenario seems outlandish. For fun, I went ahead and simulated the season quickly, stopping only for injuries and without looking at waiver wires or trades. I did make some moves based off injuries but did not do an in depth simulation with me running all moves (may do that later). The simulation ended with the Orioles going 61-101 and earning the top overall pick in the 2020 amateur draft. I released Trumbo after he came off minor league rehab because he refused a demotion and eventually released Chris Davis in August after trying to stash him in the 60-day DL and a minor league rehab. I went with the full youth movement on August, promoting Austin Hays, Yusniel Diaz, Ryan Mountcastle who joined Anthony Santander who was brought up earlier in the year. It’s worth nothing that Yusniel Diaz, Ryan Mountcastle, Anthony Santander and Austin Hays to a lesser extent all hit well when given opportunities. Anthony Santander would have ended up the team MVP despite not being with the team all season. While this is just a fun exercise, I’ll do a more detailed season season simulation later where I’ll adjust all the players in the minor leagues as well. You too can have some fun by going out and getting this great game. Maybe I’ll simulate a whole true youth movement year in 2020?